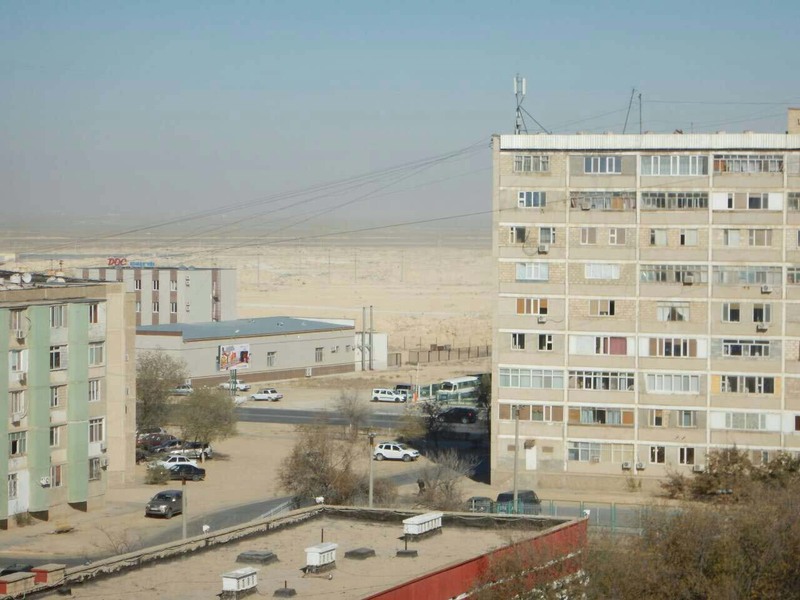 Apparently the Professor made an early morning arrival at the Kazakh port of Aktau, but as we woke up at midday in our cabin we had neither been chucked off the freight ferry nor were we on our way back to Baku. It turns out that Aktau harbour only has one loading bay, which becomes an issue if you want to unload your ship and someone else has nicked the only parking space. Aktau, then, clearly not a hub of commercial shipping. However never to be downhearted we danced away the waiting time on the Professor’s decks, until we were pulled up in front of a serious-looking Kazakh customs officer who had boarded and was (presumably) doing a drugs check. Being questioned by our first Kazakh reminded us that the Kazakh people are, in fact, in no way similar to what Borat would have us believe. Our military officer was tall and clean-shaven, with rifle, snow-khaki uniform and Russian fur hat, facially far more Asian looking than Sasha Baron-Cohen’s moustachioed dark skinned creations. Also perhaps unsurprisingly, as we moved through Kazakhstan no Borats nor Bilos jumped out from behind bushes at us, nor was there rampant antisemitism and women were allowed to travel on the inside of buses. So in that respect it’s a bit unfortunate that Kazakhstan is linked so automatically for so many of us to Borat – a show which is also so unfortunately hilarious! 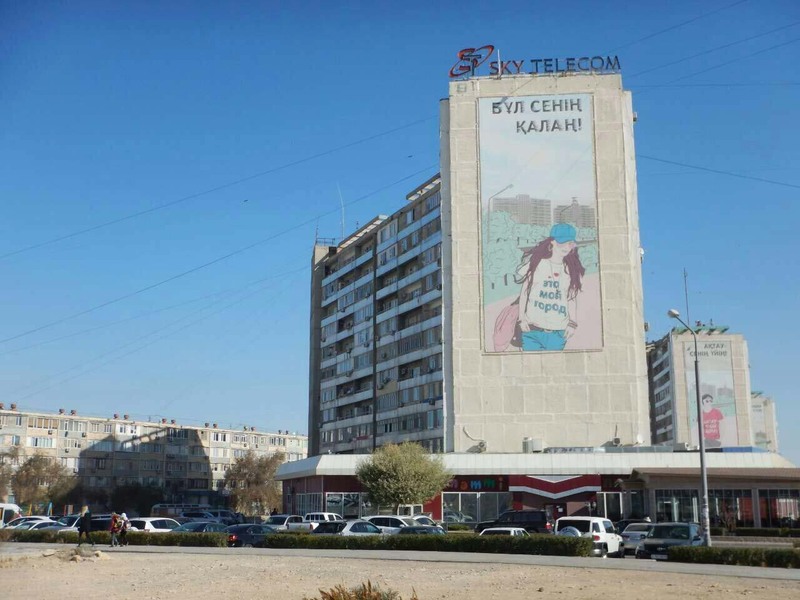 Many Kazakhs we asked knew about it and were understandably pissed off at the ridiculous way Kazakhstan has been portrayed to the Western world. You’ve got to feel for them really. Having now spent nearly a whole extra day waiting to unload we were relieved to breeze through customs finally, wave goodbye to the Professor and test our wheels for the first time in Central Asia. Fortunately we had a host in Aktau as it was already getting dark, lovely Lyazzat who must have one of the best jobs in the world. Working one month on, one month off, she is a Russian-English translator for an oil company based near Aktau. When she worked she had a Scottish boss with a real sense of humour; otherwise she was travelling. Ideal. 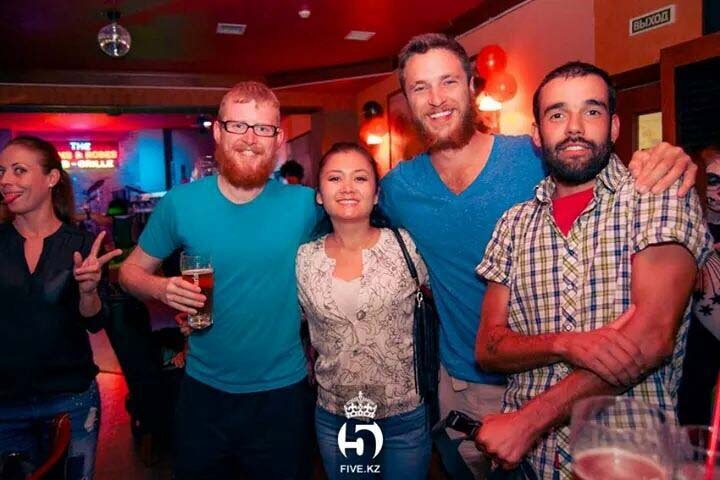 She showed us a fantastic time in the otherwise faceless Soviet town of Aktau, taking us out to celebrate Halloween with her mates at a bar with a live Kyrgyz band. The bouncer initially didn’t let us in, based rather dubiously on us not wearing smart enough shoes. 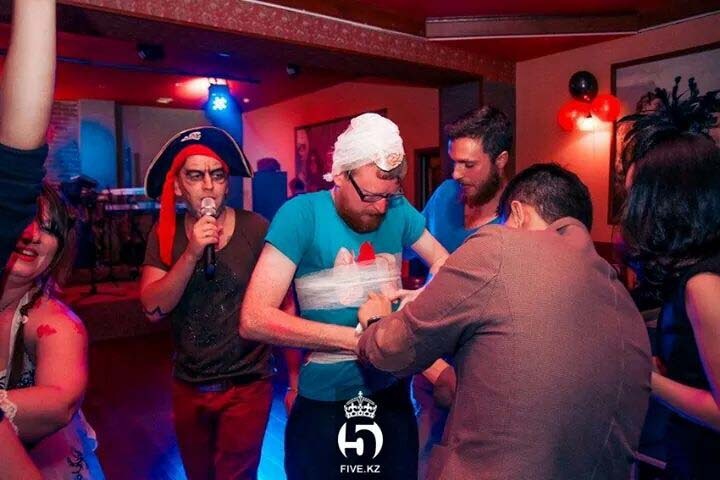 We pointed out that we had cycled from London to spend Halloween at their bar, and then spotted from the door some dressed-up children running around barefoot on the dancefloor (it was that type of place). He conceded to that last point. We were let in and over the course of the evening took part in an all-Russian Halloween trivia (didn’t go well), played pin-the-organ on Lobby (a Halloween classic) and sang with the band to what we assumed at the time to be rapturous applause. Time was ticking though. 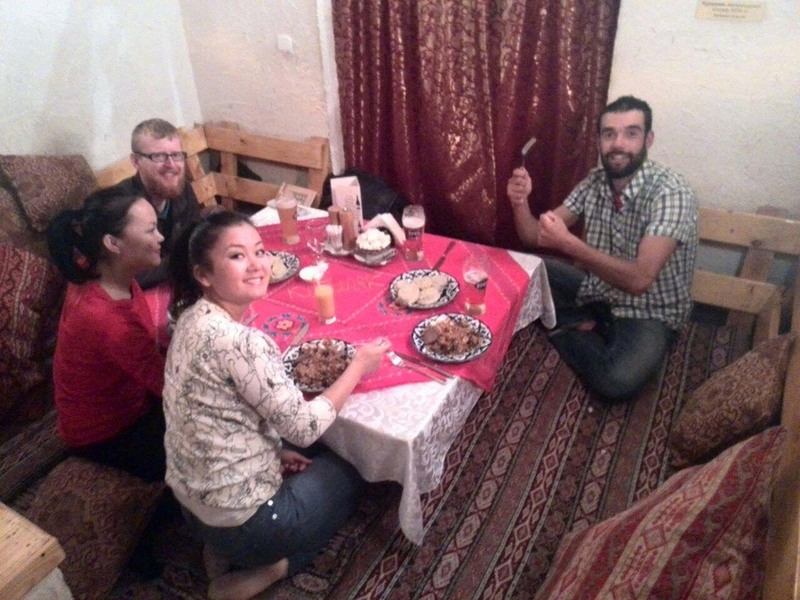 After a good night’s frivolities we got down to the more serious issue of route planning, which was essentially an estimation game of how far we could cycle daily across the deserts of Kazakhstan and Uzbekistan without collapsing from exhaustion. 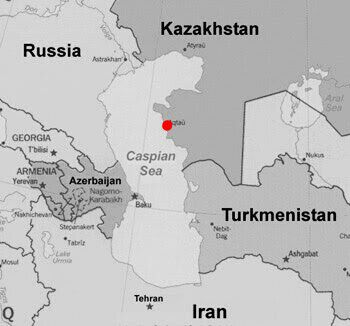 Not being able to cycle through Turkmenistan adds very significant mileage to our journey (see the map below! ), significant because we have no extra time to do the extra distance in. A whole domino-effect of visa constraints meant we needed to be in Dushanbe, the capital of Tajikistan, by the 21st November. We were facing the unenviable task of crossing 1600km of Uzbek desert in 15 days (the yellow line) rather than the planned 500km in the same time frame after a dash through Turkmenistan (the blue line). 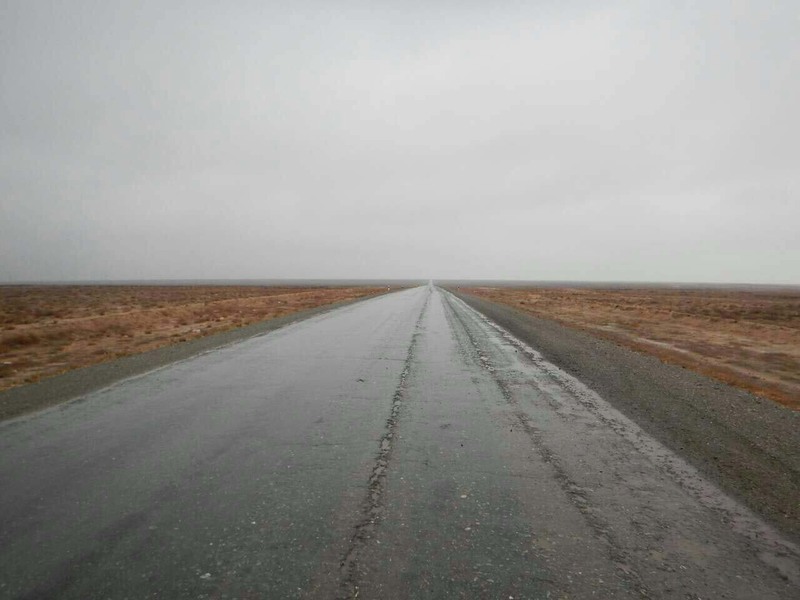 All this on Central Asian roads, not widely renowned for their quality. 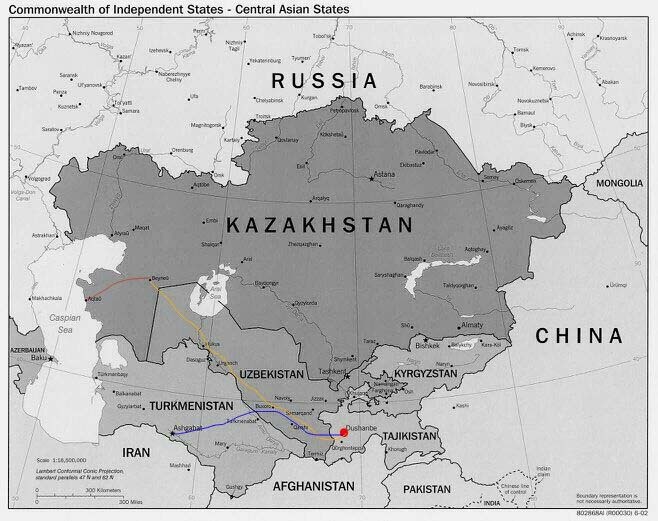 To add an extra level of impossibility, to get to the starting point we would need to cross 500km of Kazakh desert (the red line) a stage with roads so awful that it has been nicknamed “The Bicycle Demolition Derby” by the crazy cyclists who attempt it. We were fortunate to be in touch with a friend who had attempted that stage last year, when Kazakhstan only issued 5 day transit visas. Running out of time he ended up having to hitch. His only advice: “Don’t do it. Hire a hovercraft or a helicopter instead. Just don’t do it. 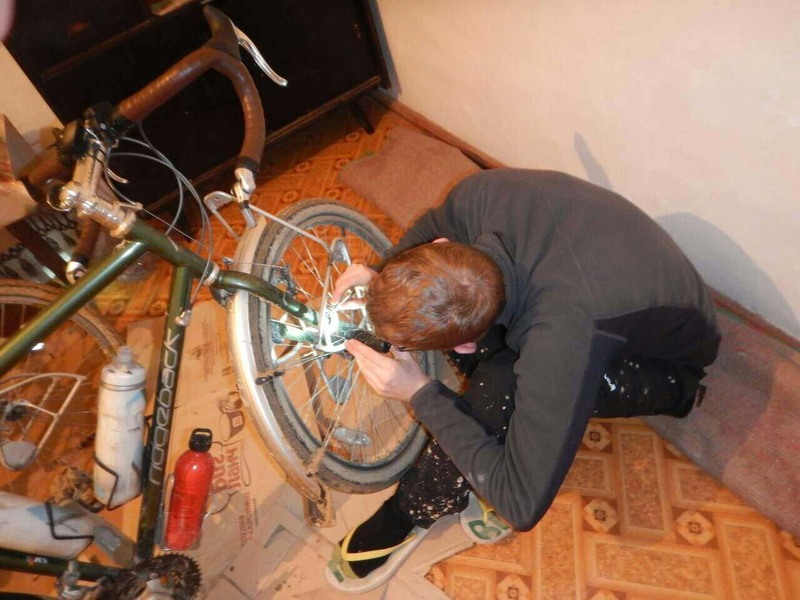 Hellish.” The clincher was meeting a Spanish cyclist in Aktau who was travelling the other direction to us, from China back to Spain. He had taken the train across the Demolition Derby. 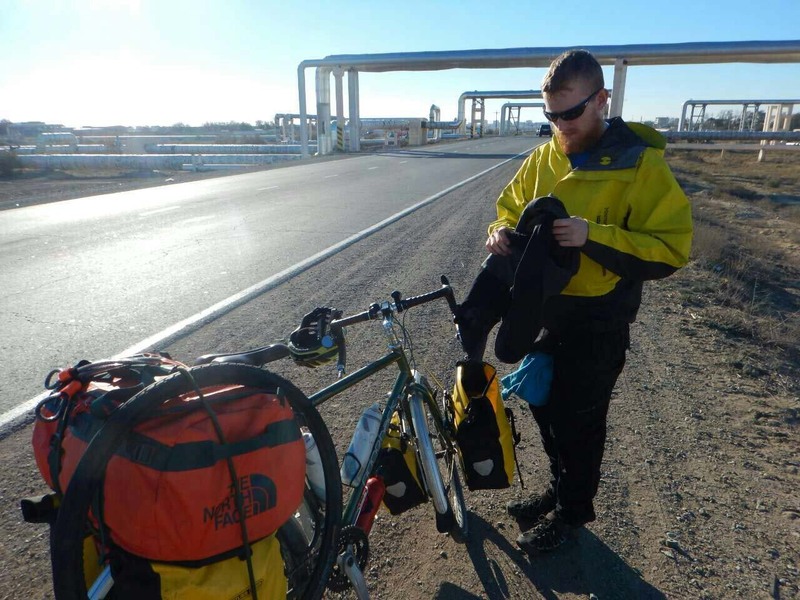 He looked over our dates and distances carefully, compared them with what he had just cycled, then declared that what we were thinking of attempting was impossible. 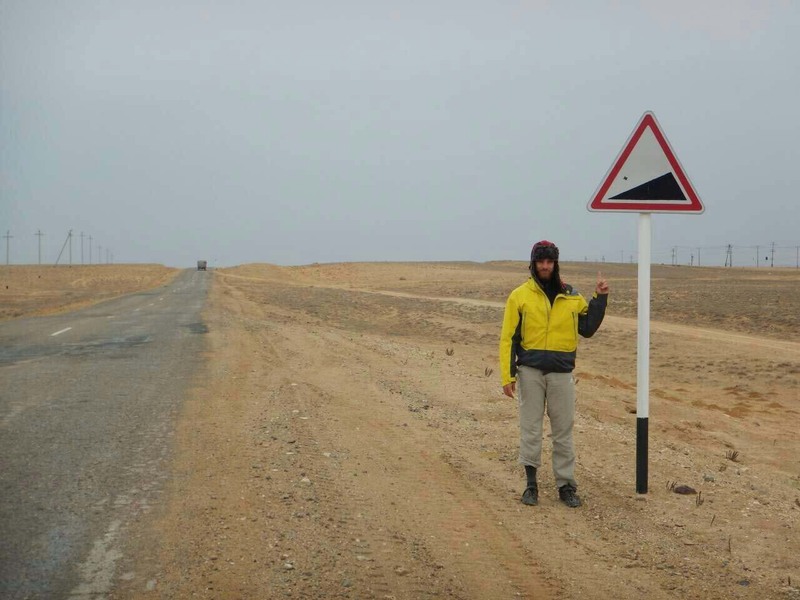 We would be left with one week to cycle 1600km across the desert, he reminded us rather grimly. Even doing that distance in two weeks would be very, very tough. “Eh, you crazy British!! Two weeks. That is the minimum.” When a Spaniard gives you such succinct advice, you have to follow it. Our route options to Dushanbe: red, the Demolition Derby; yellow, death in the desert; blue, the conventional route. 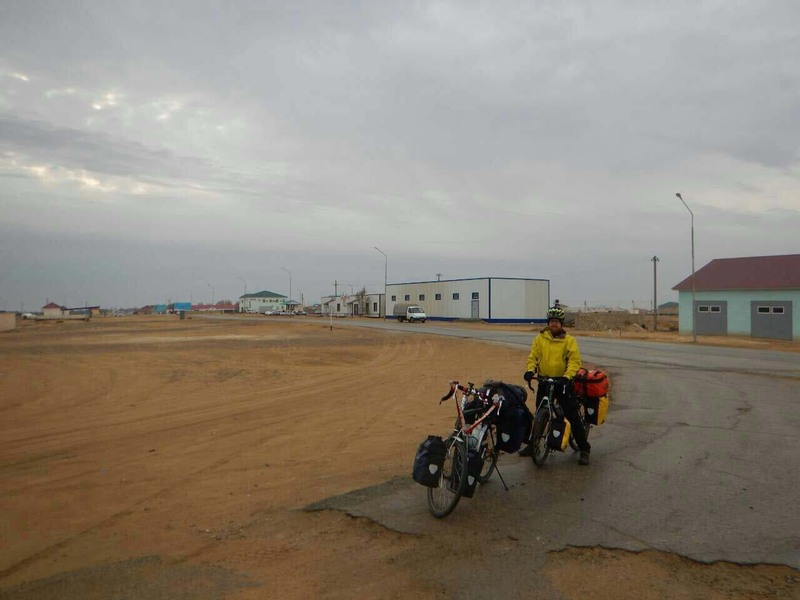 So we took the train north from Aktau to Beyneu, a small town 90km from the Uzbek border, covering a week’s worth of destructive cycling overnight. 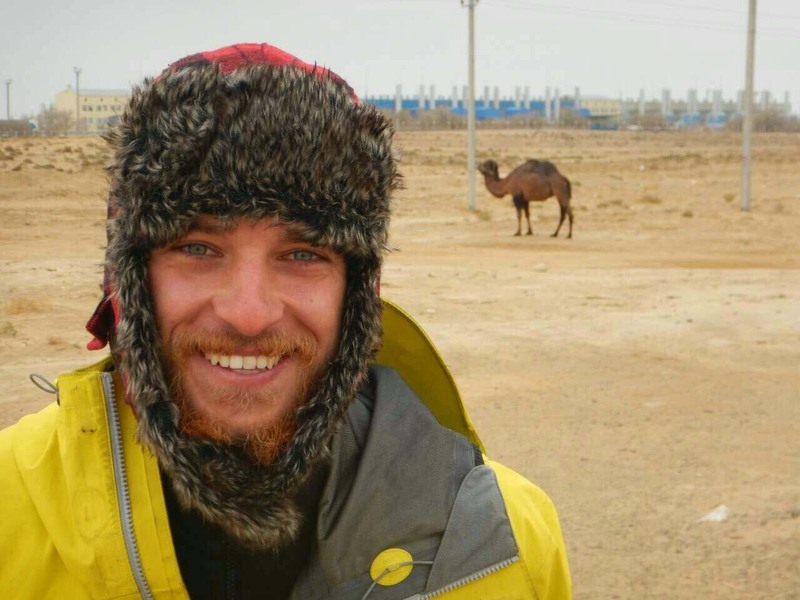 We disembarked in a tiny oasis town in the middle of nothingness just before dawn, having not had much sleep. It was spitting with rain, so we regrouped and napped on the tables of the only teahouse in town. 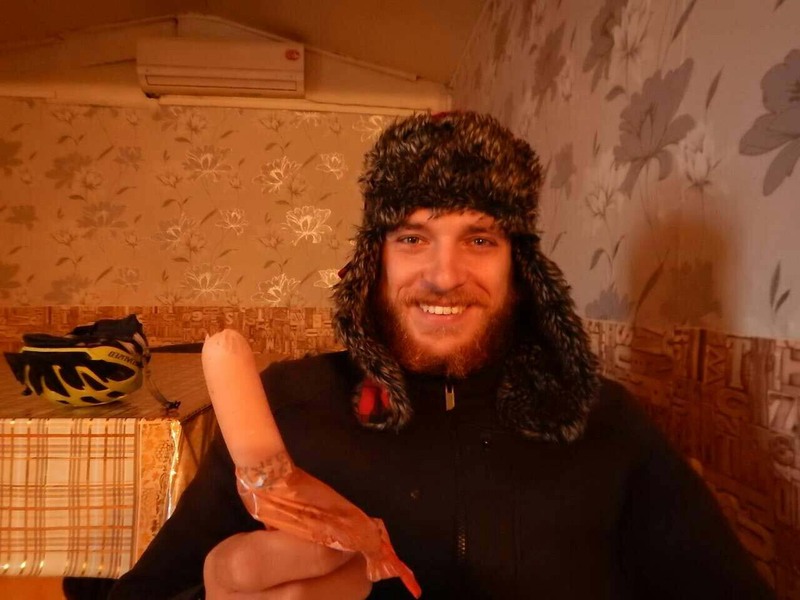 Plastic sausages for breakfast made me very glad we had planned the Operation! 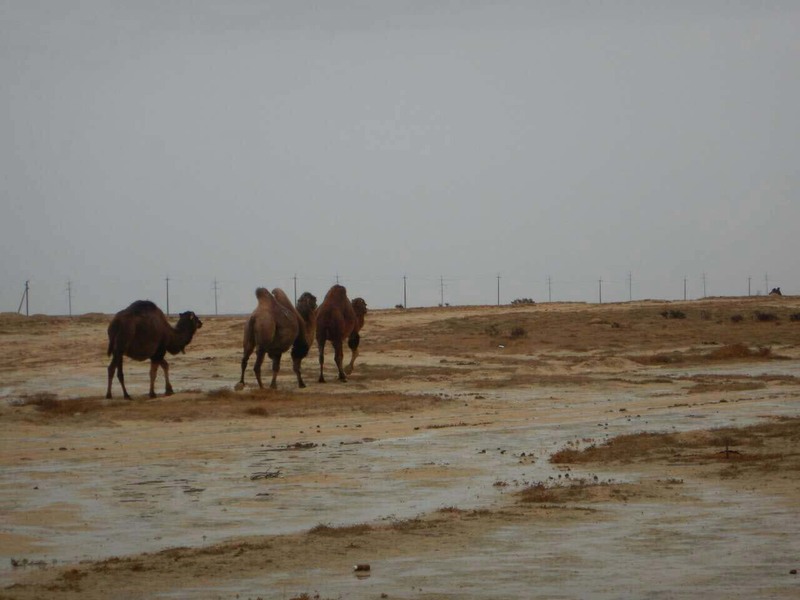 We spotted our first camels of the expedition just as we joined the road out of town into the Kazakh desert, the sheer excitement of which possibly sent our tired brains over the edge. Who doesn’t enjoy a plastic sausage of a morning? 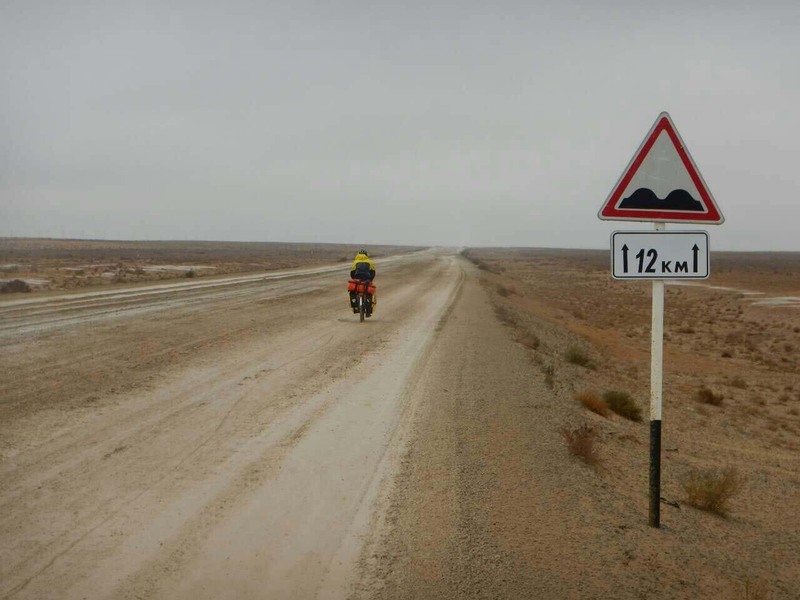 We had 90km of desert to cross before the Uzbek border, which formed the last section of the Bicycle Demolition Derby – as foolish Europeans we thought this distance could be done in a day. We were entirely misguided. 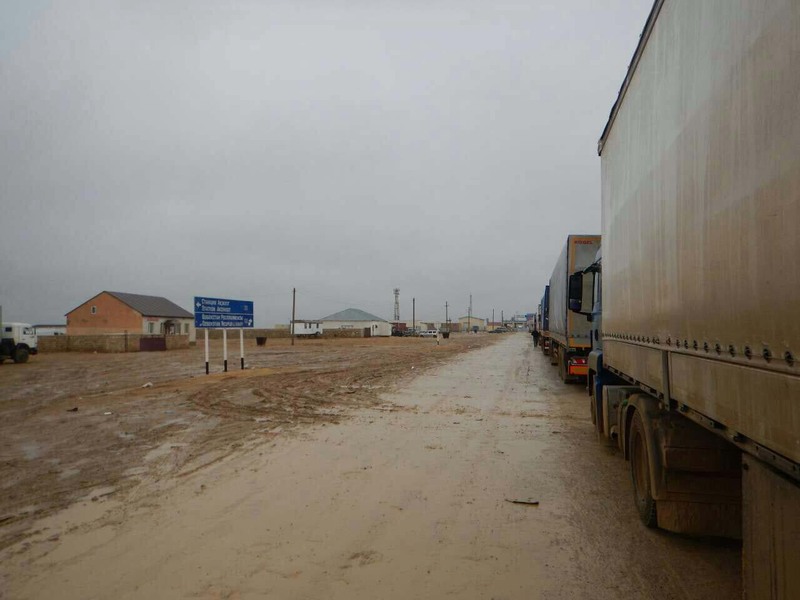 The road out of Aktau essentially disintegrated into the sand, leaving deep fissures and potholes the size of minibuses, which had started to fill with water as the rain intensified. 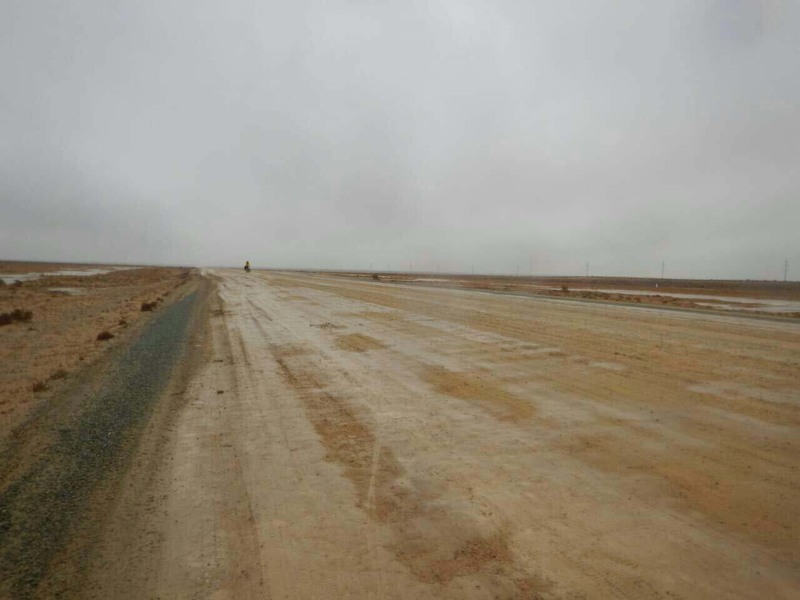 The rain also churned up the sand into mud, which stuck to our wheels and bicycle chains – the occasional cars splattered this mud across our trousers and shoes as they overtook us at a slow jogging pace. Our feet quickly turned numb from the drenching, as temperatures stayed nicely below freezing all day. A few kilometres in we were given respite from the mud-slinging as cars chose to chance it offroad, cutting a zigzagging path across the sand. When traffic chooses to avoid the road you’ve got to start asking questions. These cracked pieces from hell had no right to call themselves road. There were no signs of any use, and so nothing to judge distance except our odometers, until they gradually stopped working as they clogged with mud too. Hellish. By nightfall we had cycled a miserable 50km without stopping except to wipe the mud down from our bicycles. The only traffic stupid enough to follow this route were Russian convoy trucks and heavily-laden Uzbek family cars (was Aktau a tourist destination?!). The rain had intensified and worse still, Lobby’s front pannier rack had cracked due to it being excessively jolted around. It really wasn’t looking good. Miraculously we spotted a group of muddy houses on the horizon so we limped towards them, a wretched gathering of half a dozen grey buildings which called itself a village. The smell of gas greeted us from a leaking pipe as we approached. Who in their right mind would want to live here, I thought. Some quick negotiating and we were given a spare room in someone’s shack. Who in their right mind would want to cycle here, they probably thought. 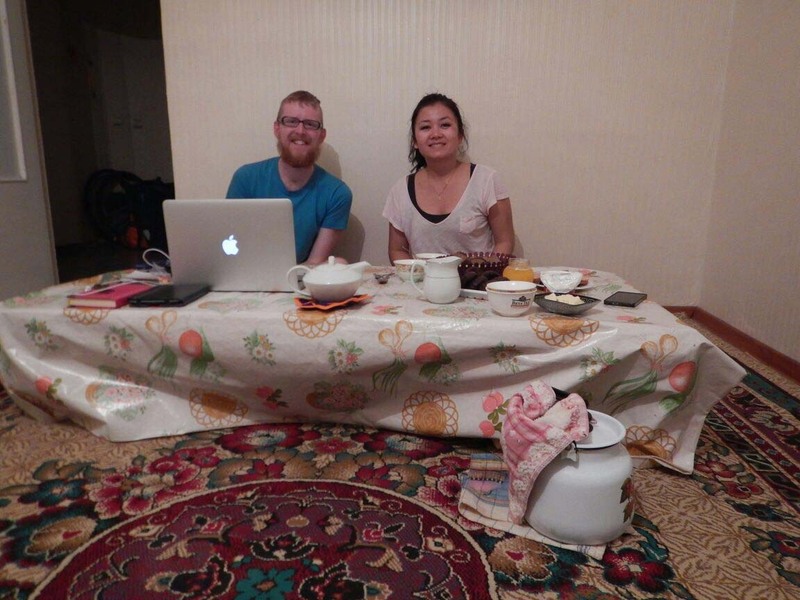 Determined not to be thwarted so early by our first Central Asian challenge, we set the alarm for dawn. However when dawn came, I discovered that Lobby was immovable. I mean Lobby is not much of a morning person, but this was something different – groaning and clutching his belly, all a bit worrying really. So we slept on to give Lobby some recovery time and then struck out for the last 40km to the Uzbek border. Both of us now on anti-diarrhoea pills, as the desert is an unforgivingly barren place if you need the bathroom! Similarly slow, painful progress until the border, as our planned dash across Uzbekistan became more and more unlikely with each jarring bump. 1600km in this?! It was Day Two and we weren’t even at the starting line yet! 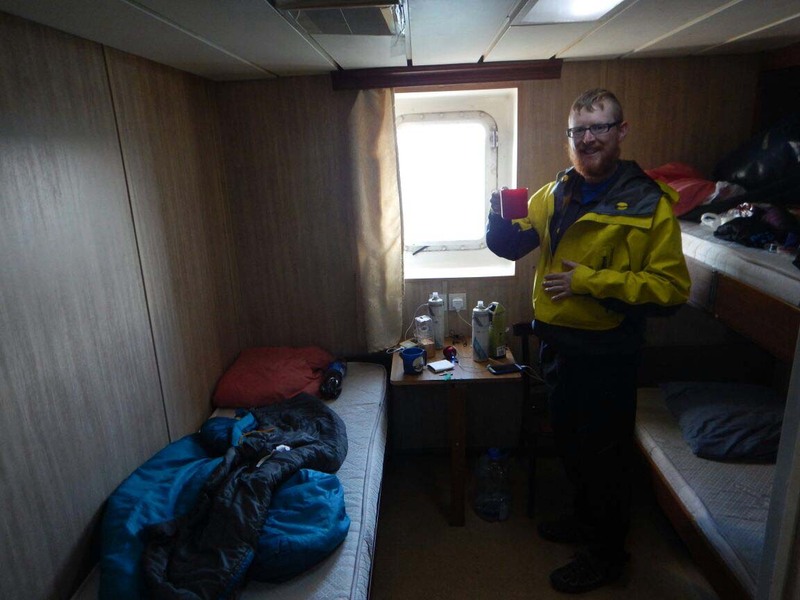 Morale sunk very low very quickly and remained low until the border, some six hours later. 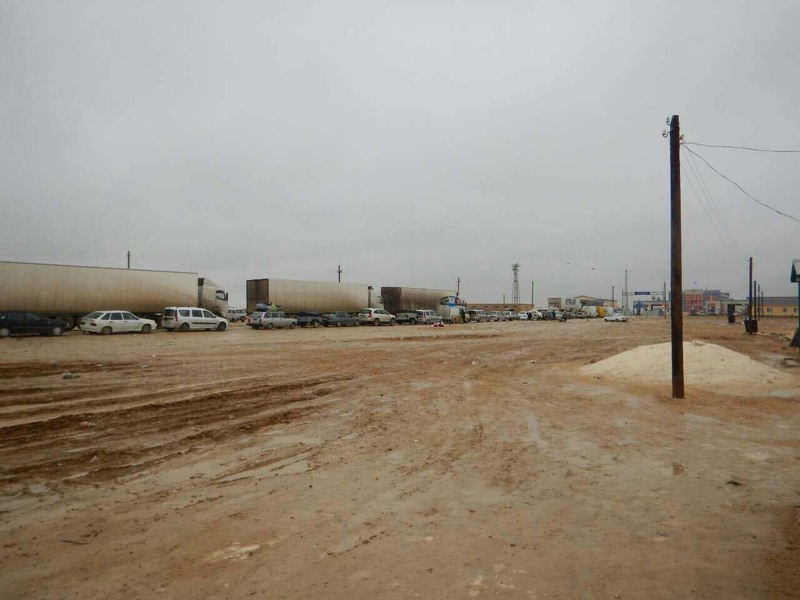 A long queue of dirty trucks was the first sign of the approaching Uzbek border. Then a fence, in what seemed like a randomly-drawn line across the desert. As we drew close and worked our way to the front (exploiting our vehicle/pedestrian ambiguity to the full) we were greeted by a trumpeting of horns from the stationary traffic, waves and shouts of encouragement coming from all sides as we inched our way out of Kazakhstan. Apparently cars were routinely held at the border for two to three days: these drivers had each overtaken us over the past two days, and were now cheering us on instead of covering us in mud! We returned most of their smiles, except those whom I remembered had gone out of their way to wallpaper us in desert (mostly Russians). They got a very satisfied two-finger salute. A cute Kazakh border lady practically chatted us up as we were given our exit stamps, asking all sorts of questions about our trip and giggling at our poor Russian, which eventually prompted her more serious (male) supervisor to take over the process! She looked crestfallen. We were wished the best of luck and given firm military handshakes as we left Kazakhstan. The Uzbek border entry couldn’t have been more different: we were immediately directed to the pedestrian queue, which felt a bit like a scene from Titanic, when the third-class passengers are kept trapped behind the grate by the crew as the ship is sinking. People pushed and shouted until getting arbitrarily chosen by a soldier on a raised platform at the front, which meant they could squeeze through the gates to the next queue. It was now very cold, and not knowing when the border would close there was a real sense of Titanic urgency. Our turn eventually came, as it began to snow gently. Endless forms and questions and a full bag search, the highlight of which was a soldier with decent English sniffing most of the contents of our first aid bag as he went through it. Asked light-heartedly whether they had dogs which might be better for the job, the man pointed outside and replied completely deadpan, “We have dogs also.” And continued sniffing. Getting the giggles at this point would have delayed us several more hours, so it was hard to know where to look! 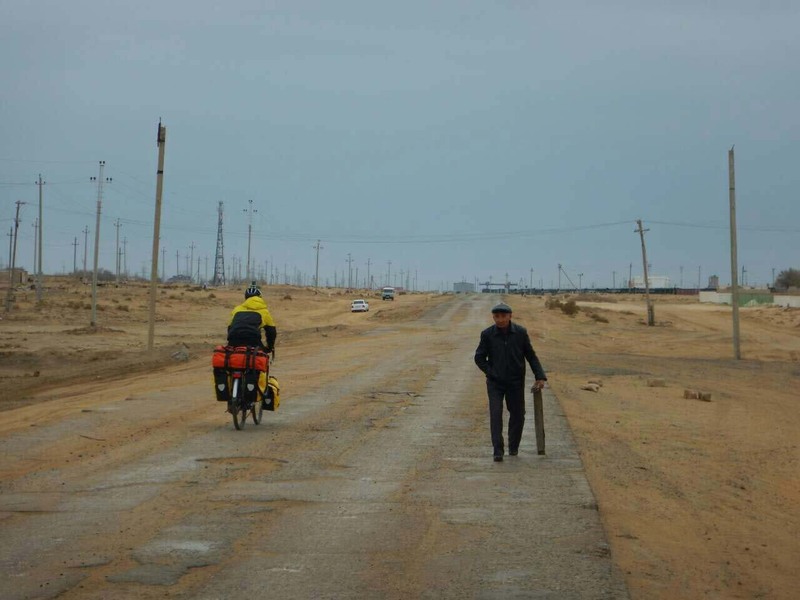 This entry was posted in Uncategorized and tagged Aktau, Cycle to the East, cycle touring, Kazakhstan, Laurence Gribble, Nick Codrington, Prostate Cancer UK. Bookmark the permalink.